Well today’s bake is simple since it is a four ingredients in equal amounts put together and you end with such a delicious, spongy cake, that is very hard to resist. It really is a piece of cake to bake this one. I personally don’t see it as an indulgent kind of cake, it is more of an everyday cake to enjoy without the guilty feeling. It is the ultimate French sponge bar, called “Quatre Quart” meaning four quarters. 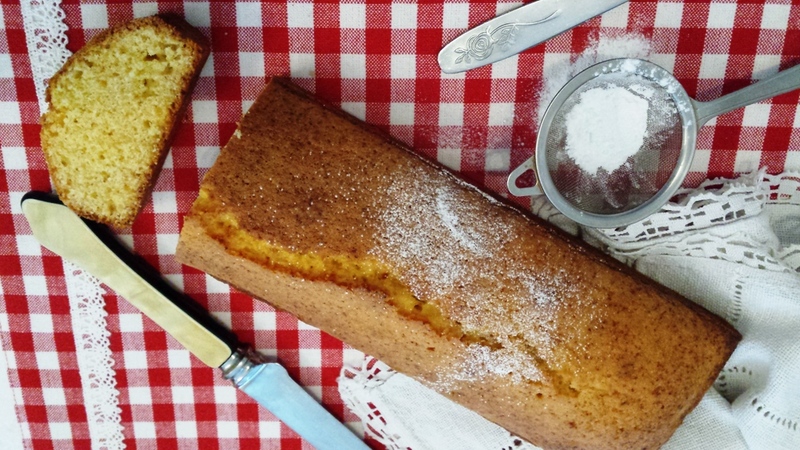 It is our classic pound cake. I have been in love with this cake for a long time, memories of my very first trip to France. Little did I know why this cake was called “quatre quart” until not long ago, shame on me despite my fluency in French I didn’t work it out – how embarrassing!!!! Since then nothing has change I still buy a bar of “quatre quart” sponge every time I go to France and bring back home. As I was dreaming of a little trip to France, but due to other commitment I can’t go just yet, so it was time for me to get baking. And quite rightly so, it had to be this one. Enjoying a thick slice with a coffee or cup of tea is enough to satisfy my craving. So if you are craving for a slice, I can only say I can’t share with you, so why not get in the kitchen and try making it. The crack and the bump across in the middle is a good sign as it is the traditional look of a good “quatre quart”cake. Since I mentioned equal amounts of ingredients, I weight the whole eggs first then depending on the weight I base all the rest of the ingredients on the same weight. In a medium size bowl beat the eggs and sugar until light and pale. Sift the flour and baking powder in a bowl, melt butter in microwave and set aside. Add the flour to the egg mixture followed by the melted butter. Pour the cake mix into the prepare tin and bake for about 25 to 45 minutes. Enjoy with a lovely cup of tea or coffee. Brinda’s Note: You can flavour the cake with lemon, vanilla essence or other flavouring of your choice. Using the same recipe you can make a chocolate marble loaf.